On 25 June 2017, a 15-year-old youth from Beit Fajjar is arrested by Israeli soldiers at 3:00 a.m. after his father was taken as a hostage. He reports being interrogated without prior notification of his right to silence or consulting with a lawyer. It was a festive night in the village, the night before Eid, and I was out with my friends very late. At around 3:00 a.m. my uncle called me and told me that Israeli soldiers had come to our house looking for me. He said they wanted to arrest me and that they had detained my father and would release him once I turned myself in. I immediately went home to say goodbye to my mother. My uncle was in touch with my father who was being held at a nearby military base. A group of soldiers met us at the entrance to the village and my uncle handed me over. The soldiers immediately tied my hands to the front with one plastic tie which was not painful. I was also blindfolded. I was then put in the back of a military jeep where I sat on a metal box on the floor. The jeep drove to where my father was held and the soldiers released him. 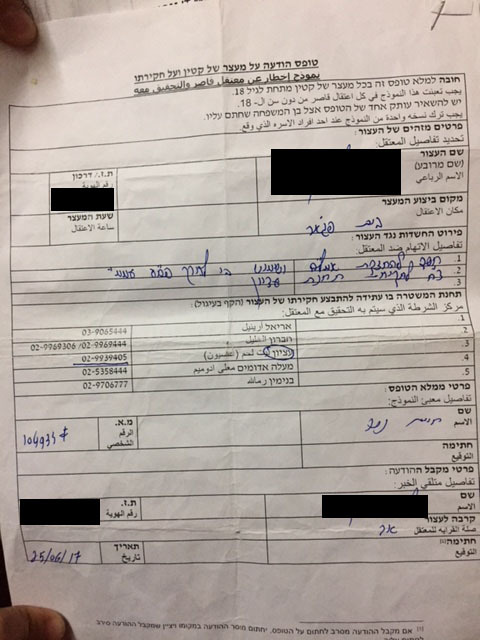 They gave my father a form filled out in Hebrew with details about my arrest. The jeep drove to the police station in Etzion settlement where I was put in a shipping container and placed on a chair. During this time I intermittently fell asleep. I was also examined by a doctor who removed the tie and the blindfold and put them back on later. Then I was taken for interrogation. I didn’t really know what time it was. The interrogator kept me tied and blindfolded and immediately accused me of weapons possession. He did not inform me of any rights. Initially I denied the accusation. But then I became scared when the interrogator started to yell and swear at me calling my mother and sisters "whores". When I asked him to remove the blindfold he deliberately tightened it even more. Later on he removed the blindfold and replaced the plastic tie with metal handcuffs. I was so scared that I confessed to making pipe bombs. During the interrogation the interrogator offered me cigarettes but I refused. Then he made me sign documents written in Hebrew. I signed without understanding what was written. Then I was taken to see another interrogator. The second interrogator was typing on a computer and asked me to repeat what I had told the first one. He did not inform me of my rights but half way through the interrogation he told me I had the right to talk to a lawyer. He phoned a lawyer and allowed me to speak to him. The lawyer told me not to confess but I told him I had already confessed. The second interrogator also made me sign documents written in Hebrew. After the second interrogation I was photographed and fingerprinted. Then I was strip searched and made me crouch up and down while naked. Then they took me to a prison cell at Etzion where I was given some food. At around midnight I was transferred to Ofer prison where I was searched with my clothes on and taken to Section 13. The following day I was taken to Ofer military court. My lawyer was in court and the hearing was adjourned. I had about 12 appearances in the military court during which not much happened. At the last hearing I was sentenced in a plea bargain to two months in prison and fined 1,500 shekels. I was also given a suspended sentence but I can’t remember the details. My conviction was partly based on the confession of another boy who the interrogator told I had confessed against him, which was not true. I accepted the plea bargain because I was told by my lawyer I would spend more time in prison if I rejected it. I spent my entire sentence in Ofer prison and I was released on 23 August 2017. In prison I did not study because I no longer go to school. My parents did not visit me in prison because I was released before they were issued with a permit to visit. On 24 October 2017, soldiers again came to our house at around 12:30 a.m. My mother woke me up and told me the soldiers had come back. I was terrified because I thought they had come to arrest me again. When my father answered the door they handed him a summons for me to show up in court as a witness on 5 November 2017. I went with my father on the specified date and I testified as requested. I have been reluctant to leave home since I was released. I haven’t been to Bethlehem which is about 30 minutes from my where I live because I don’t want to be seen or stopped by soldiers. The first few days in prison were very difficult especially because I missed Eid with my family. It was hard for my family too who did not celebrate because I was not with them.